"Index G" – reveals the number of website pages indexed by Google. Allows to choose your Google region in additional settings. You can also check the number pages that Google use in search results, except “snivel” pages (Supplemental Index) in % ratio. "Index G Page" - Indexing of the given website page in Google. "Dmoz" – checks the presence of the website in Dmoz - the largest catalog in the net. If present in Dmoz, PR is highlighted in bold type. "WebArch" – is the month and the year of the first log in WebArchive. This is the service that tracks the age of the website and the history of its changes. It also allows to download (recover) previous versions of the website. 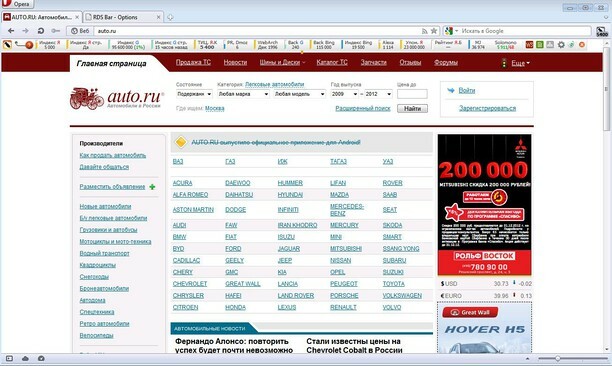 "SEOMoz" - Authority of current page and the domain in SeoMoz base. "Back Google" - is the quantity of the most important inbound links to the website in Google search engine (link:). Usually pages with great weight and high PR are shown. Bear in mind that the results are given for individual pages, not the website in general. "Back Bing" - Number of members of the most tangible links to a site according to Bing. "Bing out" -is the number of outbound links from the website by Bing search engine (linkfromdomain:). "Index Bing" – is the number of website pages indexed by Bing including subdomains. "Alexa" - is the rating by Alexa, based on data received from the users that use Alexa Toolbar. The less the number the more visitors the site has. "Back Alexa" - Number of members of the most tangible links to a site according to Alexa. "MJ" - Number of inbound links by MajesticSeo.com. "Semrush" – Semrush data. Website rating according to the number of visitors that come from the first 20 Google search results. Search traffic – Number of visitors that come from the first 20 Google search results per month. Price – approximate cost of purchasing the same amount of traffic (visitors). "Images G" - A number of website pictures that are indexed by Google. Might be useful to those who has photo-websites or site where main traffic is generated by picture downloads. "Website traffic" - Website registration check in the most popular systems of website statistics. Their availability for unauthorized users. Traffic value for the last 24 hours or for the previous day. In case Google Analytics counter is present on the website, after clicking on “Statistics” option the quantity of websites in RDS base, which are on the same Google Analytics account, will be shown. (Authorization is required). "Validator" - Checks the validity of page’s make up according to validator.w3.org standards. "Robots.txt" - Availability of robots.txt file in the website root, at aiming the editing dates are displayed. "Sitemap" - Availability of sitemap.xml file in website root. - rel="nofollow" tag highlighting. Opportunity to set an allocation style by yourself. - External link highlighting. Opportunity to set an allocation style by yourself and exclude those websites where this check and highlighting is not necessary. 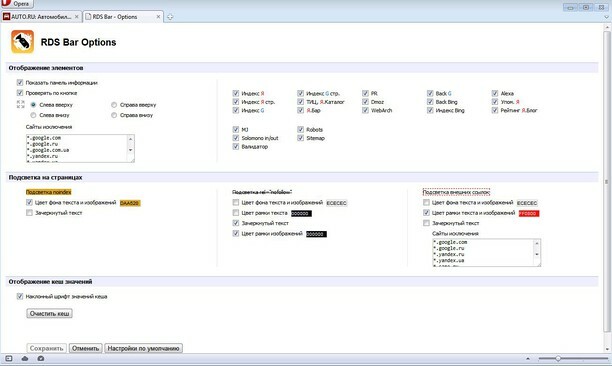 - Authorization on recipdonor.com website using the plug-in allows to control the balance in system, go to necessary website sections, use a range of additional paid functions. - Displaying by the plug-in of encached values to avoid requery. Opportunity to set an inclined font for such values. Opportunity to view the content of plug-in data base in convenient format, directly in web-browser, use filters and export. - Option of additional settings for options and receiving of "problematic" data through API RDS to avoid periodical captcha. It is especially actual for “G-index”, “Page G-index” and other values. Queries are sent to our Recipdonor.com service, after processing you receive the final result. For details about flow of fund on the account and service cost see our website. This method will prevent Google ban of your IP and will save the time for captcha input. Gaining of values can take from 2 to 15 seconds. - Plug-in can work in "by button" mode, that is to send queries about option identification for current page on demand, not always, as in standard mode while tag browsing. Plugin is available for 2 language versions: English, Russian. Plugin is distributed free of charge for everyone. The use of this software product means your agreement with application rules (licenses) of search systems, queries you make by means of this software. Attention! If breaking the rules penalties are possible from the site of search systems in form of captchas or temporary restriction of access. It is also possible to improve current plug-in for your tasks: adding of options most important to you, creation of fast links. Plug-in creation for your websites, plug-ins that optimize the work in Sape. We offer a cooperation to companies and projects that work on the market of search optimization. And we hope to be useful for each other. Ez a kiegészítő kezeli a kiegészítőket. Automatically pin or rename a tab of a site you specify or change its icon.